This morning I sent the following message to the president of the Chicago Board of Education and the CEO of Chicago Public Schools regarding a CPAA report based on the findings of our recent contract survey. It is the first in a planned series of CPAA efforts to change policy for the benefit of your schools and students. Without the participation of principals and assistant principals, this effort could not have happened. From those of you who completed the survey, to those who came together at the CPAA offices to analyze the results and write the report, all of you made a difference. It is this kind of member-driven advocacy that will improve the lives of students and educators in CPS. I will send follow-up information soon. In the meantime, please read our statement to Mr. Clark and Mr. Claypool below, and follow the link to see the first draft of our groundbreaking report. Attached you will find a draft of the first in a series of reports released under the series title After the Ink Dries. The title is a reference to the work that still needs to be done on the issues that were at debate during the CPS/CTU contract negotiations. This first report was produced by a team of principals and assistant principals across Chicago. It is titled Inequitable and Fiscally Negligent Charter School Policy at CPS: Double Standards Lead to Systematic Misappropriation of Funds. The report is based on our recent survey of principals and assistant principals. As you may recall Mr. Claypool, I gave you and your staff an opportunity to have input on the content of that survey, and you chose not to take advantage of my offer. The report is also based on publicly available data released by the district in September. This report documents (1) systemic abuse of the expulsion policy by charter school operators, made possible by CPS disciplinary double standards; and (2) institutionalized misappropriation of funds that results from CPS's failure to hold charters accountable for these abuses. First, we would like to give CPS the opportunity to comment on the accuracy of the information and offer your perspectives before we make the report available to the media, parents, and the general public. We believe the best-case scenario is for CPS to hold charters accountable for following the CPS Code of Conduct in regard to student disciplinary matters. However, we are willing to accept some degree of flexibility for charters on some matters, so long as they are held to the exact same standards for suspension, and — especially — expulsion. This means the same standards for expulsion referral, expulsion hearings, and placement when expulsion referrals are approved. When students leave charter schools — for whatever reason — CPS must deduct the full funding for those students from its regular payments to the charter schools and put those funds directly in the budgets of the district-run schools these students enroll in. The extraordinary Chicagoan Ida B. Wells once stated, “The way to right wrongs is to turn the light of truth upon them.” As I wrote above, our ultimate goal is to right this wrong by creating policies that establish a level playing field for charter and district-run schools. Toward that end, we intend to shine the light of truth upon the district’s biased double standard and the resulting misappropriation of funds. This will include engaging parents, community stakeholders, and lawmakers in efforts to address these issues. However, we need not shine the light any further than necessary to accomplish that goal. If revealing these inadequacies to you and your board is enough to convince CPS to make these changes, then a broad public release of our findings would be unnecessary. Our goal is not to embarrass the district; it is to create fair and equitable policy. However, if — upon being informed of this injustice — the district decides not to act, we will shine the light as far and wide as need be to establish fair, equitable, and responsible policies for the students and families who rely on Chicago’s public schools. We will make a decision about the roll out of our report — and subsequent advocacy efforts — on Monday, October 17, at noon. As I mentioned, we will not take public action until after that time. We will, however, inform our key partners and legislative actors of our preliminary initial findings and overtures to CPS by copying them on this communication. We hope that you and the Board will take the time between now and then to prepare feedback on the content of our draft report, and offer a definitive response to our policy recommendations. If you would like to discuss this issue between now and Monday, please feel free to contact us. CPAA is pleased to provide you with this early draft of a special report created using data and feedback that was gathered from a survey regarding the CPS/CTU contract. We would like to acknowledge the principals and assistant principals who helped draft this first report, and thank the more than 350 school leaders who lent their voice to this important discussion. We look forward to presenting more of their feedback in coming reports. 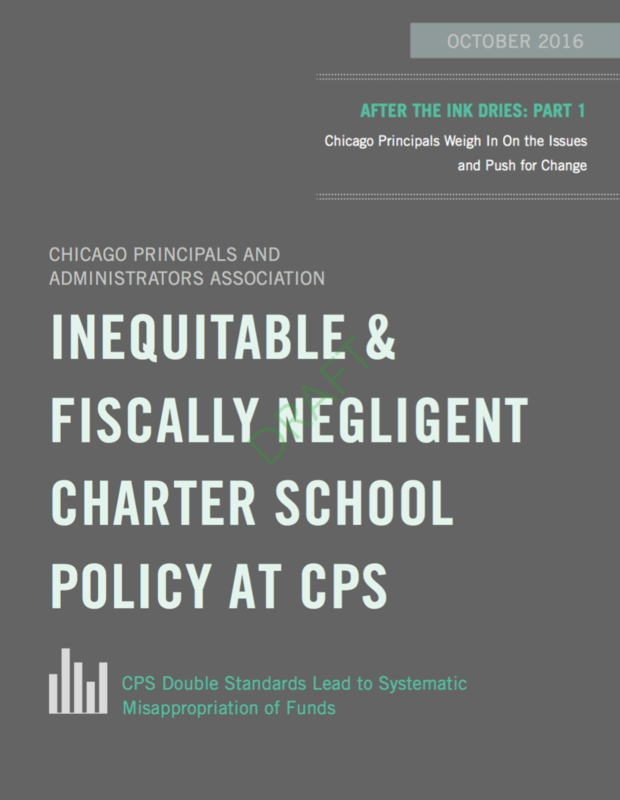 To view the first report, INEQUITABLE & FISCALLY NEGLIGENT CHARTER SCHOOL POLICY AT CPS, you may click HERE.